We are taking orders for 2019. The first nucleus colonies normally become available for collection in June and then on throughout summer - it is naturally variable so the availability date below is for guidance. Bees for sale - Our Nucleus Honey Bee Colonies are bred in U.K. supplied on a minimum of 5 combs with a U.K. bred laying queen. 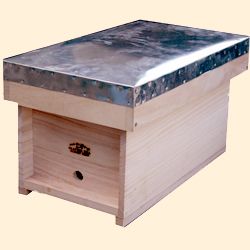 They are supplied ready for transport in an appropriate nucleus hive which is included in the price. These nucleus colonies are supplied on Standard Deep Hoffman frames suitable for National and WBC hives with a Standard Deep Brood box. We expect this to be available Monday 17 June, 2019.